Correcting a construction error. The builder didn’t insulate the garage ceiling, but Carolina Energy Conservation can do the job quickly and affordably by installing dense-pack cellulose. Exterior siding is replaced after the blow-in installation. Looking to improve the comfort in an above-garage living space? Contact us today if you just want to know how to improve your garage insulation in Myrtle Beach, Charleston, Sumter, Florence, Bluffton, North Charleston, Mount Pleasant, Beaufort, Goose Creek, Darlington, and other nearby towns and cities. Improving garage insulation just takes a phone call. Contact Carolina Energy Conservation for a home energy audit or a free insulation quote. Along with any garage insulation upgrade, Carolina Energy Conservation will also air-seal the garage to eliminate energy-wasting leaks and prevent harmful auto emissions from entering your living space. When a house is built, the common wall and ceiling between the garage and the home's living space should be air-sealed and insulated. But builders sometimes skip this step. Carolina Energy Conservation can inspect your garage and correct garage insulation problems. 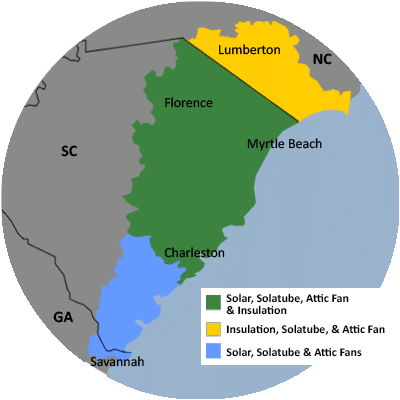 Call 1-855-410-0662 or contact us online to schedule a Free Quote for garage insulation in Sumter, Charleston, Myrtle Beach, and neighboring locations such as Mount Pleasant, Florence, Bluffton, Darlington, Beaufort, Goose Creek, North Charleston.